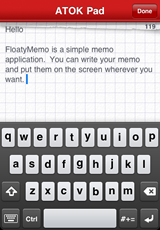 FloatyMemo / FloatyMemo+ are simple note applications like "sticky note" for iPhone/iPad (Universal application). 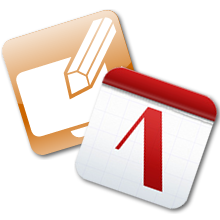 FloatyMemo / FloatyMeo+ have a feature to integrate with ATOK Pad. ATOK Pad is a note application which contains the dedicated Japanese input method, and it has functionality to cooperate with the external applications. Please refer ATOK Pad pages (in Japanese) for the details. "ATOK" and "ATOK Pad" are registered trademarks of JustSystems Corp.
Tou launch ATOK Pad, You can press "action button"
If ATOK Pad has been installed, you can see "Launch ATOK Pad" option in the action sheet. You need to back to FloatyMemo using "Return" button on ATOK Pad, otherwise you will lose the changes of your notes in ATOK Pad. Please don't open Home nor launch any other applications during editing in ATOK Pad. If you turn on the "ATOK integration" in the settings. 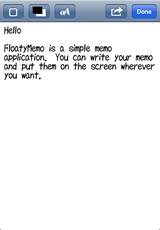 FloatyMemo always opens ATOK Pad to edit the note. In the editor screen, ATOK pad will be launched by tapping text in the note. Of course you can launch ATOK Pad via action button on the editor screen. However usually you don't need to press the button to launch ATOK Pad; just tapping text.